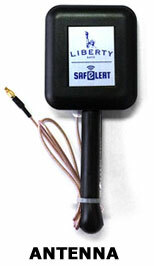 Liberty Safe has just introduced the SAFELERT wireless monitoring system. This will notify the safe owner instantaneously if the safe is moved, if the safe door is opened, or if there is a notable change in safe temperature or humidity. 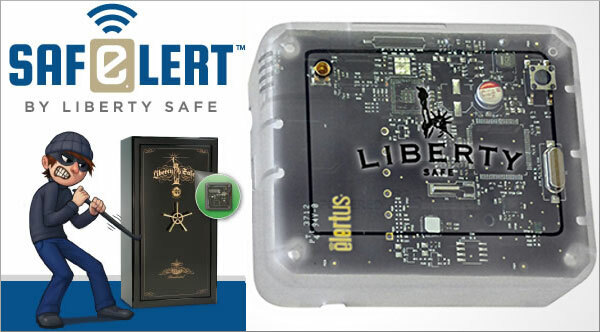 Liberty’s SAFELERT is small, battery-powered sensing device placed inside your safe (easily hidden out of view). When something happens to your safe (e.g. movement, door opening, humidity change etc.) the device detects the activity and sends alerts (via texts or emails) directly to the safe’s owner. The SAFELERT works wirelessly via your home or business network. You just need a WiFi router plus at least one networked device (computer, tablet etc.) on the system. If you can open an internet browser page and enter a few numbers, you can get the SAFELERT running in minutes. Communicating via the web-based elertus.com service, SAFELERT monitors your safe and immediately sends you (and up to 4 recipients) alerts when the “triggers” are activated by tampering, door opening, or temp/humidity changes (inside the safe). The SAFELERT also sends a message if its batteries run low or if your WIFI connection fails (hourly network checks). You can “test-drive” the system via Liberty’s SAFELERT demo page. Log in to set a trigger type and receive a simulated alert message. 3 Years at $39.95/year; 2 Years at $49.95/year; 1 Year at $59.95/year. As an extra incentive, Liberty is currently offering the first month of monitoring for free. In most cases, SAFELERT will function well with your wireless router (WiFi system) without a separate antenna. But for situations where WiFi network reception is weak, Liberty includes an antenna to enhance SAFELERT’s reception range. The antenna is placed on the exterior top/side of the safe, with a wire connecting it to the SAFELERT device hidden inside the safe. Writing in the Firearm Blog, Richard Johnson points out some issues with any WiFi-Based security system: “The system … connects to the internet via your home WiFi connection. Therein lies the point of failure. If thieves are breaking into your home, they might first hit your phone/cable connection which will prevent the SAFELERT from contacting you. A workaround would be to have a MiFi or similar device that connects to the internet via cell signal.” We should add that the elertus.com service does promise to check your WiFi connection every hour and send you a message if the WiFi connection drops. But a lot can happen in an hour…. Share the post "Liberty Safe Offers Wireless Monitoring Device for Gun Safes"